These little sponge cakes with a chocolate icing and coconut crust are named after Lord Lamington, who was Governor of Queensland from 1896 to 1901. The story goes that some sponge cake was dropped into chocolate sauce and the coconut coating was an attempt to recover the mess. Lord Lamington would apparently refer to them as 'those bloody poofy woolly biscuits'. Preheat your oven to 160°C (320°F) for a fan oven, or 180°C (356°F) for a conventional one. Line a square baking tin with greaseproof paper. Cream together the butter, sugar and vanilla essence until the mixture is light and fluffy. Add the eggs, one at a time, beating until each is fully incorporated before adding the next. Add half of the sifted flour and milk and stir to combine. When fully mixed in, add the rest and mix again. Pour the mixture into the prepared tin, smooth the top and bake for 30 minutes. A skewer inserted in the centre should come out clean and dry. Let the cake cool in the tin for 10 minutes, then tip out onto a wire rack, cover with a clean tea towel and allow to cool completely, preferably overnight. Sift the sugar and cocoa into a large bowl. Cut the butter into small chunks and add it with the milk and boiling water. Stir until smooth and creamy. Cut your cake into small squares and dip each one into the icing using a fork. Try to get each piece coated all over. Put the coconut into a separate bowl and dip each piece of cake in. Shake off excess coconut and place on a wire rack to set, about 2 hours. The video above is from the Keef Cooks YouTube channel. 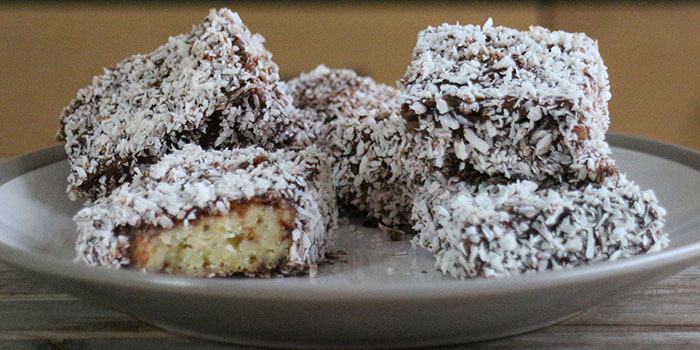 Click here to see the video recipe of Lamingtons on YouTube. Prep time: 20 minutes. setting time: 2 hours. Total time: 2 hours 50 minutes.